DDR3 memory is a new trend especially being used in mainstream notebook and with its affordable pricing now, it has started to get design support in netbook market. Just recently, HP (Hewlett Packard) has announced a new netbook featuring Intel Pine Trail with DDR3 support and other enhancements. Named as Mini 5103, it is powered by either Intel Atom N455 or N475 (codenamed Pine Trail) replacing existing N450 (maximum clock at 1.66GHz) with relatively higher processor speed clocking at 1.83GHz. Besides, the machine is equipped with 2GB DDR3 memory RAM that is supposed to be much power efficient while boosting overall platform performance as compared to DDR2. To differentiate it from the rest, the processor has been paired with Intel GMA 3150 integrated graphics with additional Broadcom Crystal HD Flash accelerator support with the hope to handle full HD media decode without heavy CPU cycle utilization on the processor on its 1366 x 768 resolution touchscreen. In terms of connectivity, Mini 5103 is equipped with 802.11 b/g/n WiFi, Bluetooth 2.1, Gigabit Ethernet port, USB 2.0, SD card slot and 2MP built in camera. On top of these, the machine will have option of either 320GB conventional hard disk drive or a much higher performance 128GB Solid State Drive depending on consumers’ needs. 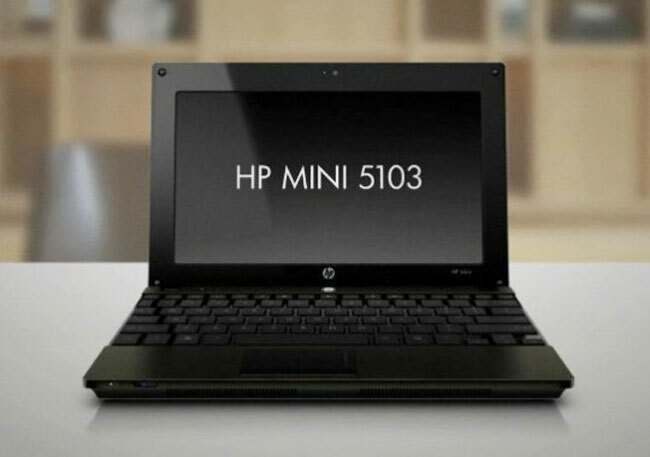 Priced at 482 Euro, Mini 5103 is already available in official HP website in Italy and will soon reaching other countries in short future.